“Western clerical celibacy is in an unprecedented crisis,” says the conservative Catholic canon lawyer Edward Peters. The reason? Since the 1960s, the Catholic Church has permitted married men to be ordained as deacons, an order of clergy just below that of priests; and in the past 35 years about 100 married converts, all former Episcopal priests, have been ordained to the Catholic priesthood. “A lot of people are going to see this as a foot in the door,” said the spokesman for the US bishops when the decision to receive these priests was announced in 1980. Are these married priests a foot in the door to end required clergy celibacy in the Catholic Church? If you ask them, they certainly don’t think so. They are an unlikely vanguard for change. Very conservative in their views, two-thirds of them oppose optional celibacy—only half of celibate priests do—and are uncomfortable with the idea that their presence may challenge it. They don’t exactly hide being married, but they don’t flaunt it either. Mostly they try their best to fit in with Catholic priestly culture and norms, not challenge or change it. People say that married priests would help end a shortage of Catholic clergy, but the response to the Church’s openness to receive married priests has so far been underwhelming. Only a handful has come in, and after an early spike of converts in the 1980s, the pace has slowed to a trickle. If it is a crisis, it seems that not many applicants are showing up. Catholic canon law defends clergy celibacy on the ground that celibate priests are more able to be devoted to the care of a parish than married ones would be—an argument that has its roots in the Bible. In my research I found that married priests worked a little harder than celibate ones did, prayed more, and were more available to parishioners in need. People often think married priests cost a lot more for a parish to maintain, but the difference in compensation is actually quite small, well under ten percent. And if the married priest gets his health insurance—a major factor in priest compensation—through his wife’s employer rather than the parish, he can cost a lot less to maintain. Image credit: ‘Prayers’ by firstworldchild. CC-BY-2.0 via Flickr. In all, marriage did not present many disadvantages for the function of Catholic priestly ministry. But it also did not present many strong advantages either in a way that would make an urgent case for moving to optional celibacy. The last three popes have all encouraged married priest converts from Anglicanism while making it clear that they have no thought of changing the rule of celibacy for ordinary Catholic priests. 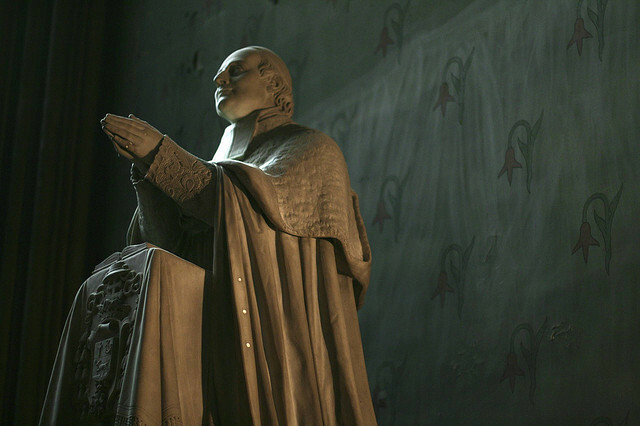 The reception of married priests was supposed to be a temporary accommodation to trauma in the Episcopal Church—a ‘pastoral provision.’ At some point, it is envisioned, it will end, and Catholic priests with roots in Anglicanism will have to be celibate, like any other priest. But it has been continuing now for 35 years, and will not likely end anytime soon. Meanwhile over 10,000 men who since 1970 left the priesthood to marry have been quietly readmitted to the priesthood after their marriages ended. And Pope Francis has also quietly ended the century-old prohibition on married Eastern Rite priests in the United States. This is hardly a crisis of celibacy, but there does seem to be a softer attitude, a growing toleration and comfort with the experience of priests who are married. In one way the married priests, without intending it, may have put a foot in the door. Married priests reported that their reception by parishioners and other priests has been overwhelmingly positive, a perception that is confirmed by the highly positive opinion that almost all priests and bishops expressed about the married convert priests in their midst. For many Catholics, and Catholic leaders, the idea of a married priest is no longer abstract or theoretical. The married priests have shown how it is that a man can be a good priest and also be married. In this way, at least, the married former Anglican priests may have contributed more than they realize to change—not a crisis, but an incremental openness—on the question of Catholic clergy celibacy. D. Paul Sullins is Associate Professor of Sociology at The Catholic University of America. He has been married for thirty years, and has been a Catholic priest for more than ten. 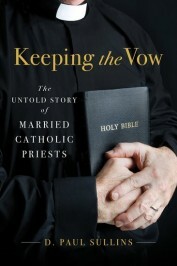 He is the author of Keeping the Vow: The Untold Story of Married Catholic Priests.